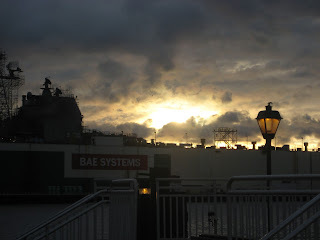 Tuesday morning we awoke to only mild winds and the sun attempting to peek through the clouds. We felt very lucky but were sobered by watching the morning news reports about what happen to the north. She may let us become a bit complacent but Mother Nature will always let us know that in the end she is in charge. The sight Monday morning was somewhat different. 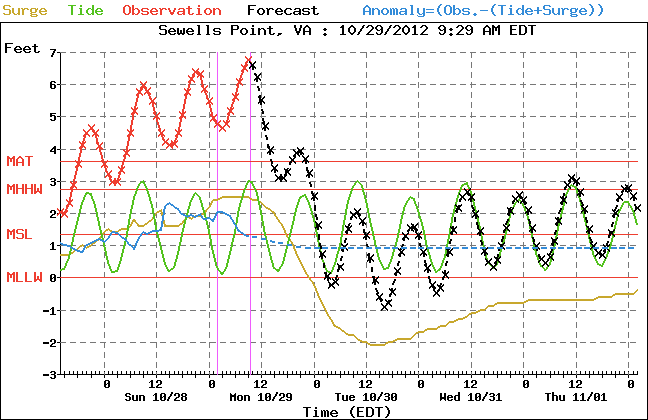 The highest tide of the storm was predicted for around 9:30 Monday morning as the surge and the tide combined. Jeff found a cool graphic on the NOAA site showing the predictions. The alarm was set for 7 am Monday morning as the dark skies were confusing our usual "alarm clock", Dylan looking for his breakfast. 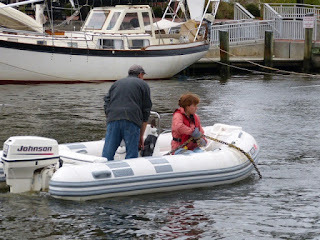 We wanted to ensure we were awake, warmly dressed, and fed so we would be ready to adjust the lines and fenders as the water rose and the winds picked up. 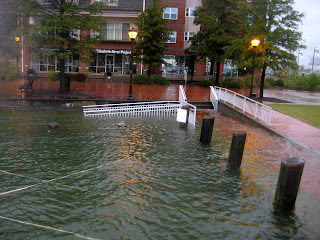 The water rose to just inches from the tops of the pilings on the other 3 docks, giving us about a foot of leeway. All the boats in the basin held fast and as the water began to recede we breathed a sigh of relief. Just about then the cold began to set in and we dug into our stash of warm clothes. 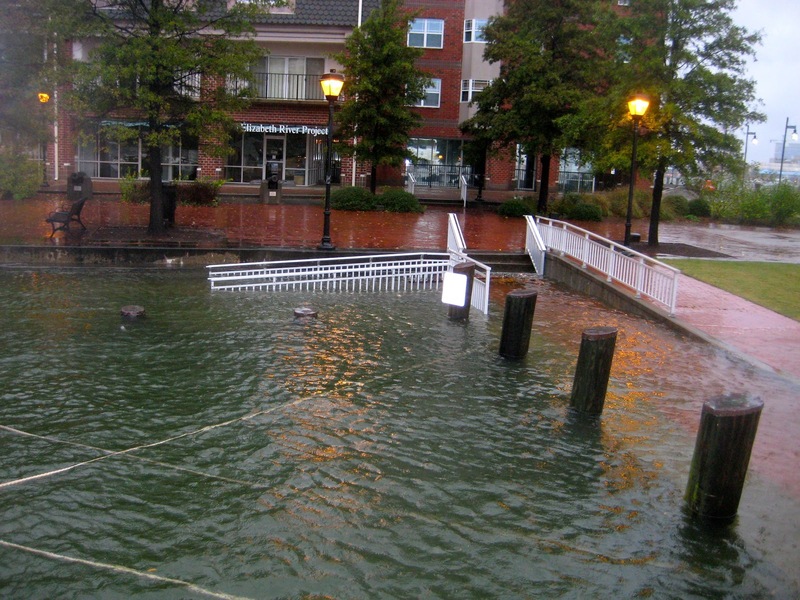 We were fortunate that the maximum storm surge was somewhat less than predicted and that the winds took longer to clock around and push us towards the pilings than expected. By mid-morning on Monday our fender boards where well positioned against the pilings as the wind pushed us hard towards shore. 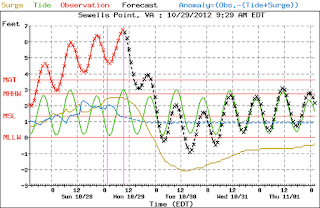 We spent the day listening to the winds howl while feeling periodic bumps as the winds pushed us against the pilings. But we knew we were safe. By evening we had pulled the boat back close to the docks and decided to go into town for dinner to celebrate. Even bundled up in our foul weather gear it was a cold and blustery walk. We decided on Chinese food and when the waitress ask us what we wanted to drink we both said, "Hot tea!" Back on the boat we setup the rabbit ears and pulled in some local news for the first time thinking about those further north and hoping all would be well. As the temperatures dropped and we wished we had one more dog we remembered a small ceramic heater we had tucked away and pulled it out. It at least took the edge off. We set it up in the stateroom as we went to bed and even had to get up in the middle of the night to turn it off. Today we worked to out the boat back to rights. The morning was spent putting the bimini and antennas back up on the flybridge. It was cold with occasional gusts of wind. We kept winter gloves on except when we had to use our fingers for something. Dyna sat on the settee in front of the ceramic heater until she got too warm and moved to the side. As I came down to fetch things I kept wondering what was wrong with this picture. All is pretty much back to normal on board. The plan is to move down to Top Rack Marina tomorrow afternoon and stay the night. Thoughts of real heat, hot showers, some laundry, and a fabulous meal at the Amber Lantern are keeping me going right now. With a few long days we still plan on being at River Dunes Marina for our scheduled seminar on Sunday. That is, of course, if there are no other unforeseen obstacles. We've seen a few boats meander south today anxious to get going. I'm happy to let them find out first what Sandy may have left in our way. For now we are safe and dry and reasonably warm. But most of all we are proud of our seasoned crew for pulling together. With two hurricanes now beneath their belts, Dyna and Dylan have proven themselves true salty dogs. We thank everyone for their expressions of concern and warm thoughts. For now we wish the best for those who suffered far worse than we did. Please stay safe everyone. We hope to finally be moving South again by Saturday morning. We're so glad you made it through this terrible storm safely. Give Dyna & Dylan big hugs from us. P.S.We were still able to flambe Irish Coffees during the storm. As long as you can still flame the coffee you're doing well. We anchored out last night and it was cold - I told Jeff I needed one of your flaming coffees! Glad to hear you're safe also. 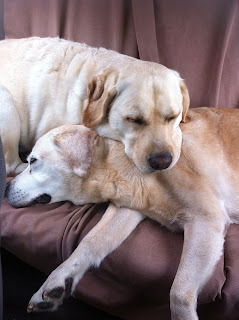 Dyna & Dylan said thanks for the hug and send back a lick... and lots of dog hair. Hope to see you soon.